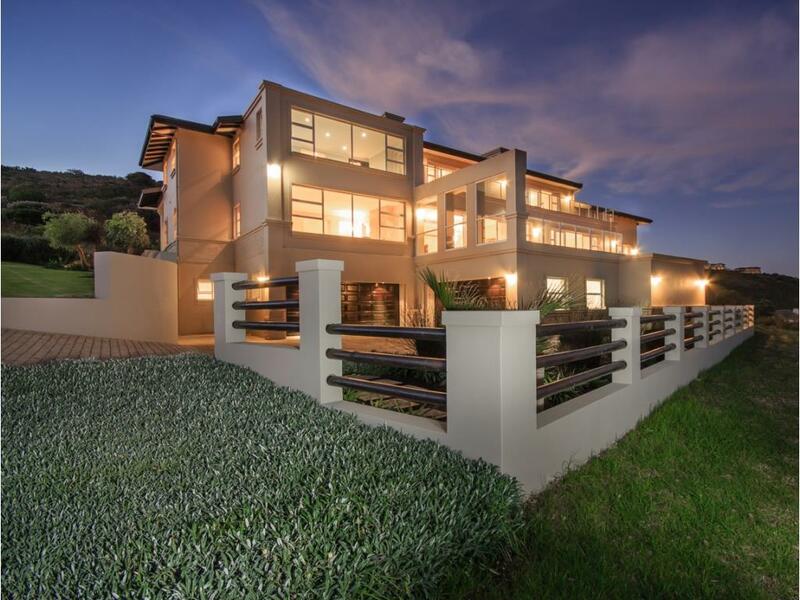 ON SHOW - SUNDAY 7 APRIL 2019 BY APPOINTMENT ONLY Spacious 5 Bedroom Villa Inside Pezula Secure Golf Estate"
This property for sale in Knysna is ideally situated on one of South Africa’s most prestigious and secluded golf courses, Pezula Golf Estate. Completed with only the highest quality materials and finishing's, coupled with breath-taking panoramic views of the ocean, spacious open plan living and security. A spectacular double-volume entrance welcomes you onto the travertine marble floors that include underfloor heating in both 1st and 2nd floor living areas. The beautiful staircase with wrought Iron balustrade and chandeliers, lead to an upstairs lounge that overlook the double-volume dining area, outside courtyard and an amazing view of the ocean from the opposite side. The same incredible ocean view can also be seen from both upstairs bedrooms. The main bedroom provides ample space with an attractive walk in dressing room, en-suite bathroom and balcony. The second upstairs bedroom has an en-suite bathroom, built in cupboards and balcony. All bedrooms have solid wooden doors, doorframes and skirting boards. When walking down the staircase, an open plan living area presents itself. To your left a spacious dining room that overlooks the courtyard garden. To your right hand side, the ocean view once again compliments the house. The entertainment room has a gas fireplace. The enclosed veranda, with option for a gas braai, separates the entertainment area from the main living room and has sliding doors that open onto a patio with swimming pool. The main living room has access to the 3rd bedroom that includes built in cupboards and en-suite bathroom. Through the hall way a mahogany finished kitchen with granite counters, Hansgrohe chromeware and large scullery bring everything together. Downstairs there is a spacious flat with a beech wood kitchen, family living area and bedroom that includes built in cupboards and an en-suite bathroom. The fifth bedroom is located on the opposite end and includes an en-suite bathroom and built in cupboards. The home also includes a beautiful guest bathroom that is situated near the entrance hall. To round everything off, we have an incredible 6 car garage and storage area, perfect for storing a boat. The villa is 5 minutes away from all schools, shops and restaurants in Knysna.